This dense and creamy New York cheesecake is bursting with fragrant vanilla in every delicious layer! Rich cream cheese cheesecake filling is speckled throughout with sweet vanilla bean flecks, nestled into a buttery crisp vanilla wafer crust and topped with vanilla-infused whipped cream. A perfect make-ahead dessert to share with the ones you love. This is a sponsored post, written by me, and created in partnership with PAM Cooking Spray. All opinions expressed herein are straight from my heart. How was your holiday week? Ours was really nice; we spent lots of time with family, and it was really good for me to recharge my batteries a bit. I have to be honest: Despite my best efforts to be mindful of how much I was taking on, December really made me miserable. It was good, and necessary, for me to unplug for a few luxurious days! I’m slowly easing back in, starting with this dense and creamy cheesecake, and keeping in mind the #1 resolution for 2016: to enjoy life to the fullest! My husband and I were watching this over the break and it really struck a chord. Last year, you may remember this was my New Year’s resolution, but like so many resolutions, over time you slowly start to forget. I’m happy for the reminder at the start of this New Year. One of the things that always tends to bring me down around the holidays is all the DISHES! Entertaining friends and family is so much fun but all those dirty dishes can really kill the buzz. Especially when you have to scrub off all that brown residue from your cake pans. So when I bake, I use PAM Cooking Spray because it really allows me to spend time catching up with my loved ones, instead of being trapped in the kitchen scrubbing gunk. Lately, I’ve been all about cheesecake. Over the past few weeks, I’ve made chocolate peppermint cheesecake bars and mini lemon cheesecakes with ginger cookie crust, and this double chocolate brownie cheesecake always gets a huge reaction whenever I post it to my Facebook page. What can I say? Cheesecake is just so GOOD! It’s always a crowd-pleaser, plus it’s a perfect make-ahead dish. This rich vanilla bean cheesecake can be made up to three days ahead and kept chilled in the fridge, so it really frees you up to spend time with your guests. It’s got intense, fragrant vanilla flavor running all throughout. The crust is a buttery layer of crisp vanilla wafers, the filling is super-dense and creamy, and it’s topped with fluffy vanilla whipped cream. If you have a vanilla lover in your life, you’ve gotta make them this cheesecake! I like to bake my cheesecakes in an 8-inch diameter by 3-inch high cake pan. Most recipes call for a 9- or even 10-inch springform pan. But I think this size is much more manageable. Also, I find the springform pans always seem to leak, even if I wrap them in foil. I think the reason for the springform is because someone somewhere thought that you needed it to avoid the cheesecake sticking to the sides, but as long as I give my cake pan a good misting of PAM Cooking Spray, I have no trouble whatsoever. Once it’s cooled, I just flip it right out and invert it onto a serving plate. Nice crunchy crust, creamy interior, and just the right size to serve 8 to 10 peeps. I think you’ll love it! This dense and creamy New York cheesecake is bursting with fragrant vanilla in every delicious layer! 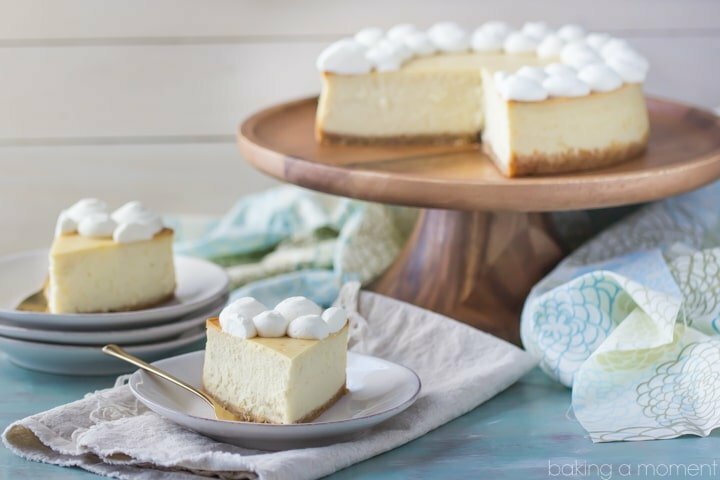 Rich cream cheese cheesecake filling is speckled throughout with sweet vanilla bean flecks, nestled into a butter-y crisp vanilla wafer crust, and topped with vanilla-infused whipped cream. A perfect make-ahead dessert to share with the ones you love. Mist an 8-inch diameter by 3-inch high round cake pan with PAM Cooking Spray and line with a circle cut from parchment paper. Drizzle in the melted butter and toss together until combined. Add the cream, vanilla bean paste, and vanilla extract, and stir to combine. Bake the cheesecake for 15 minutes, then lower the oven temperature to 300° F and bake for an additional 70-80 minutes, or until the cheesecake is set around the edges but still slightly jiggly toward the center. 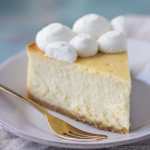 Chill in the refrigerator until ready to serve, then flip the cheesecake out of the pan and invert onto a serving plate. Garnish with whipped cream, slice, & serve. Place the heavy cream in a medium mixing bowl and whip on high speed until just beginning to thicken. Sprinkle in the sugar, gradually, while continuing to whip. When the whipped cream holds soft peaks, whip in the vanilla bean paste. Transfer the mixture to a piping bag fitted with a 1A tip. Pipe whipped cream around the outside edge of the cheesecake. With all the planning that goes into putting together the perfect dish, using PAM Cooking Spray is a sensible way to save time in the kitchen. When you use PAM, you spend less time cleaning up in the kitchen, allowing for more time to be spent with the ones you love. Bonus? PAM Cooking Spray leaves 99% less residue than leading brands of margarine or bargain-brand sprays, so your dishes will turn out great, and you’ll spend less time cleaning up. *vs. leading cooking sprays (except olive oil), after spraying on glass bakeware, baking at 400° F for 30 minutes, cooling, and then washing in a standard home dishwasher with detergent, and repeating four times. 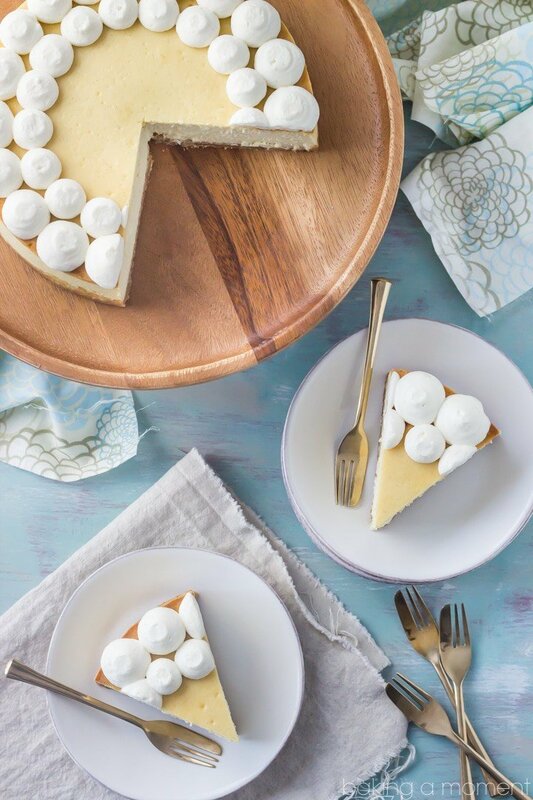 This cheesecake is seriously stunning- totally love it! Happy New Year Allie! I hope you had a relaxing break and recharged! I love your resolution and I’m going to try as well to follow. I love this rich and creamy cheesecake! I never bake without Pam so I’m glad you are sharing them with us. The dishes over the holidays brought me DOWN…it’s my least favorite part about cooking! I’m glad you got to unplug for a few days and enjoy! 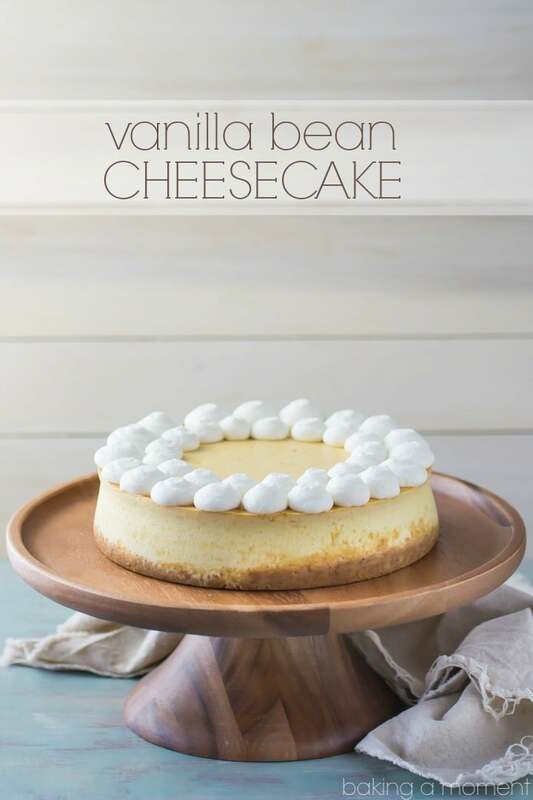 This cheesecake is gorgeous and you can’t beat vanilla bean! Thank you so much Marcie! Aren’t the dishes the worst??? And I was without a dishwasher for 10 horrible days!!! Right over the holiday break; the timing couldn’t have been worse! Aww…so glad to hear you finally took a little break, Allie. December is certainly a tough month! This cheesecake looks like perfection! I actually made one this week too, and it was the first cheesecake I had made in years and I was thinking “why don’t I do this more often?”. Ha! Love the vanilla you added to every single layer here. That looks like pure perfection! Sometimes “plain” vanilla is best 🙂 The little dollops of whipped cream almost make it look like a cloud! Thanks June! I know I sometimes forget how exciting “plain” vanilla can be! You make everything look beautiful! Nice to have you back! Happy New Year! I am glad you unplugged and took some time for yourself, Allie! Lord knows you deserve it! This cheesecake is a vanilla lovers dream!! And I happen to LOVE me some vanilla! I totally need this entire cheesecake to myself! So stunning and seriously scrumptious! Pinned! Cheers, my dear! This cheesecake is absolutely gorgeous! I always use Pam when I bake. Otherwise everything sticks to the pans, yuck!! Good for you for unplugging for a little while. We all need a break from time to time!! Thank you SO much Renee! I can’t live without my PAM, lol! And yes the break was very necessary! Hope you’re staying warm, my friend! Hallo Renee, love the cheese cake recipe. I live in New Zealand and have no idee what wafer cookies are, I only know Icecream wafers and vanilla Cream wafers. I hope you can help, I would love to make thuis cake. Hey Copelia! I’m so glad you like the recipe. Here in the states we have two main brands of vanilla wafers, one is Keebler (http://www.amazon.com/Keebler-Golden-Vanilla-Wafers-12-Ounce/dp/B000AYFDQ2/ref=sr_1_2?ie=UTF8&qid=1453251806&sr=8-2&keywords=vanilla+wafers), and the other is Nabisco (http://www.amazon.com/Nabisco-Nilla-Wafers-850-gm/dp/B00196P9OQ/ref=sr_1_1?ie=UTF8&qid=1453251806&sr=8-1&keywords=vanilla+wafers). Hopefully you can track something similar down in NZ. Good luck and I hope you enjoy! Thank you so much! We really loved it- I’m sure I’ll be making it again! Hi, I was planning on making this! Just to clarify, we actually bake the cheesecake in a pan also INSIDE a baking dish of water? Or do we take the cake pan out of the water before we place in oven? Thanks. Bake it in the water. The water should come about 1 inch up the sides of the cheesecake pan. It’s called a “water bath” or “bain marie,” & it helps to cook custards more gently & evenly. It will prevent your cheesecake from cracking! Gorgeous! Cheesecake is always a hit at my house, so everyone will definitely love this! So rich and creamy – love a classic cheesecake! This was off the chart! Best cheesecake I’ve ever had. Thx! Wow, that’s so great to hear! So happy you enjoyed, Andrea!